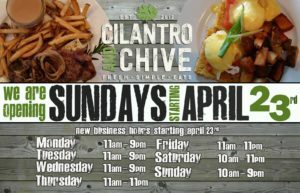 What an incredible staff meeting this past Sunday at Cilantro and Chive. Getting everyone together in a 7-day a week operation now is challenging and difficult to organize, but we were blown away by the great turnout and how engaged everyone was. We started our meeting discussing the upcoming season, but we couldn’t not start without a reflection on the year that was. We spoke on how far we’ve come this year – 2017 being a complete whirlwind of excitement and humbling attention! We’ve blown away projections from last year, we’ve doubled our employees, and we’ve exceeded ALL types of expectations. But we’re not a success right now I told them – because today’s a new day. Success is rented, it’s not owned – and the rent is due every day. Our guest’s expectations are higher than ever and those walking through those doors are wanting us to be awesome. Why are we popular? Well we aren’t perfect and could still do things a whole lot better, but the staff in that room believe in the vision that was started by Rieley and Kim from the beginning. Have fresh, simple, eats. Focus on local and the community. Treat a customer like a guest in your own home with engaging and knowledge service. And above all, have fun! Then make it our own personal “groundhog day” of a restaurant. Wake up, be awesome, repeat. We are extremely fortunate to have hand picked some pretty amazing young people over this past year. Many of whom are just looking for the ability to be creative & passionate, have fun, feel respected, experienced individuals allowed to be leaders, and above all else everyone just be themselves. We as management, we are to give them the tools to be awesome, and then just try and stay out of their way. So as we look to launch our new Autumn menu for food and beverage this weekend – we’re proud in knowing that our crew also had a hand in it. Our culinary team has helped create tasty new fall-inspired menu items utilizing locally sourced product. The service team has pushed us to develop even better systems to make us more efficient, and our bartenders have assisted us in molding creative new cocktails. All the while we have owners who constantly re-invest back into the business with their time and resources that it only pushes all of us to be better for their brand. 2017 has been an incredible ride. We are doing such amazing things at such a rapid pace, that for many of us it’s the most work, the biggest challenge… and also the most fun we’ve ever had while at work. But *never* are we sitting back and taking it for granted, because we always must be changing, growing, and evolving into something even better. All at the same time, working with 50 team members in an ever busy machine, to never forget the vision and identity of a brand and company that began with just 5 team members not that long ago. People tell me that we’re a success, I thank them and are happy they have had great experiences – but for me the true measure of success is what you’re doing today. Yes, when you’ve worked hard and accomplished a lot, especially in developing the right people in the right places on your team – that just helps give you the ability to be more awesome on a consistent basis. But what we were successful in yesterday, the bar is (and should be) always moving up. So if you want to keep in that direction = strive for perfection. You’ll never get there, but out of that journey… what you’re left with is pretty awesome. 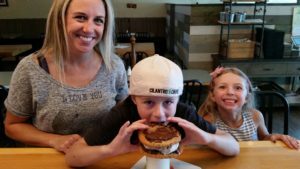 A few weeks ago, a mother and her son were sitting up at our bar at Cilantro and Chive, enjoying some lunch. 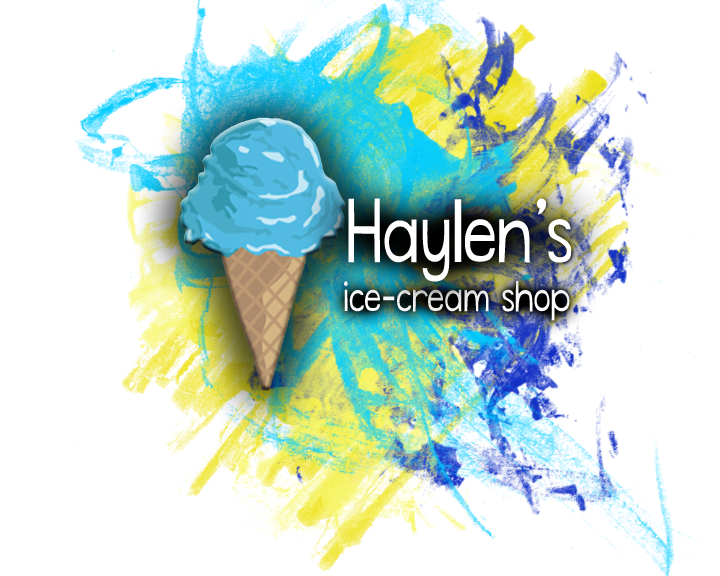 Our team was pretty taken with the little guy, and he left us his business card from – Haylen’s Ice Cream Shop. I thought to myself, “wait, I know who this is!”. 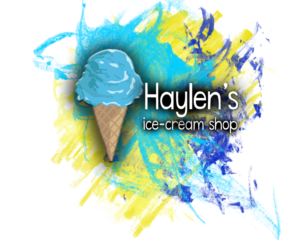 Over the last couple of years I’ve noticed Haylen’s Ice Cream Shop on Twitter, and found out that he raises money for the Ronald McDonald house by selling Ice Cream and even Hot Chocolate (in the winter). I then remembered I got myself an Ice Cream Cone from Haylen at Sobey’s South in Red Deer last year and thought how awesome this kid was! Tough to find the words to explain how great I felt! But knew that we had to reach out to him, and create a fun (and delicious) way to help him in his fundraising goal! 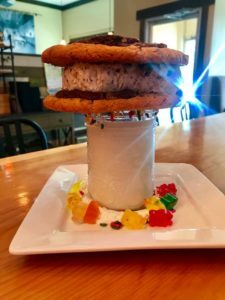 We’ve thought about creating a super fun dessert for awhile now, and we thought it would be super fun to have Haylen help us create something fun and awesome for everyone! 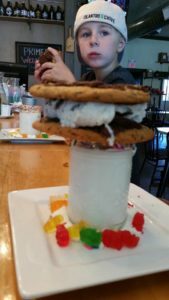 When we contacted Haylen and his Mom Tabitha, they were very excited to come back into Cilantro and Chive and help us out. 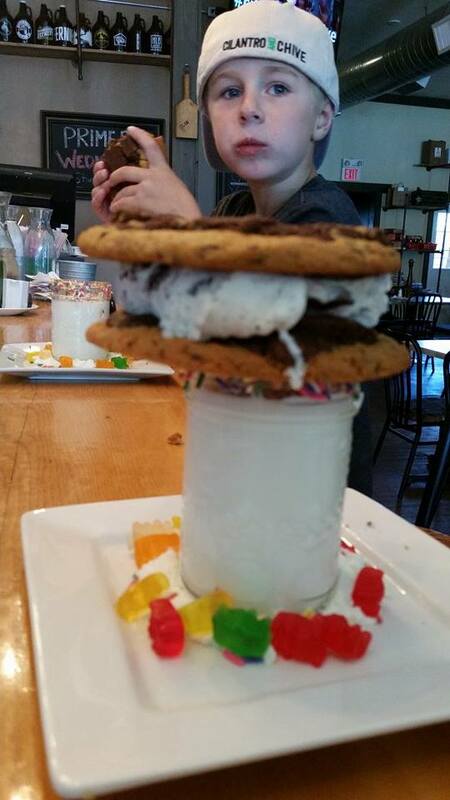 So Haylen came in, we put our thinking caps on, and got to designing what is now the Haylen’s Ice Cream Sandwich! 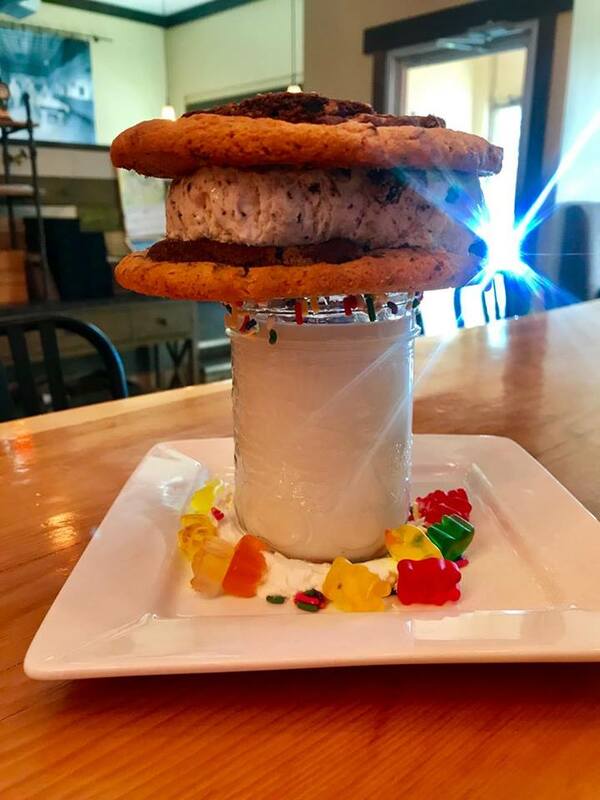 This delicious, decadent, and devine dessert is 7 year old Haylen’s favorite mix of Oreo Cookie Ice Cream nestled in-between TWO freshly baked “Brookie” Brownie-Cookies, on top of a honey sprinkle rimmed glass of 2% milk, with Fresh Whipped Cream, and Gummy Bears of course! For every Ice Cream Sandwich sold, we’re donating $1 directly to the Ronald McDonald House Charities Central Alberta. This is one VERY special kid, doing some very extra-ordinary things that will warm your heart. I just hope that my 2-year-old son will want to do things like Haylen does when he grows up more – in helping kids and others around him for a great cause. 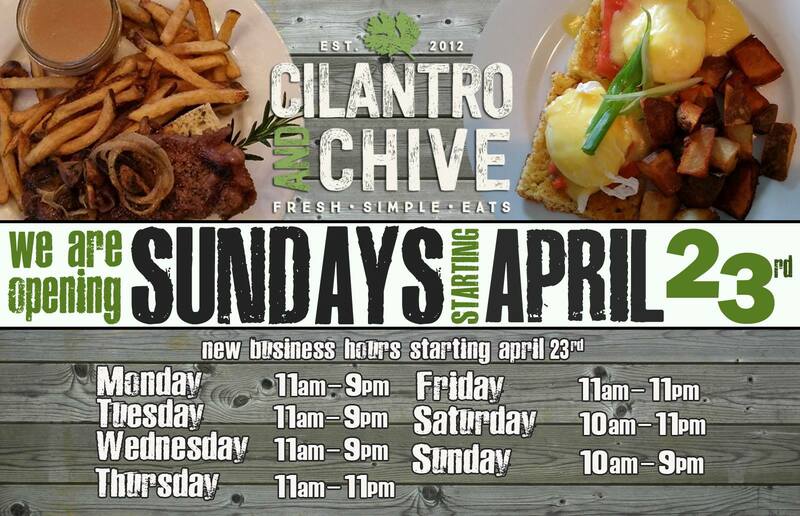 So come in to Cilantro and Chive today, and help us support such an important organization for our community! It’s a fun and delicious way to give back! 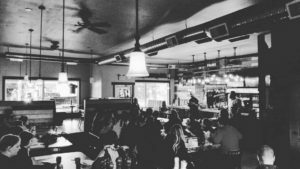 f you know the story of Cilantro and Chive, you know that we began as a dream of bringing engaging, knowledgeable, and genuine service with fresh ingredients, passionately inspired dishes, and a love to do things a little bit differently to give guests an experience that is unique. The owners, Rieley and Kim Kay – continue to work extremely hard in managing an ever-growing business, and their own family. It’s an extreme honor when someone hands you the keys to their business, they’re proverbial baby, and ask you to take care of it for them. While still keeping the core values of what Cilantro and Chive has always stood for. Chef Jarett Talbot, since his start in the Earl’s organization as a teenager, it’s been a sinuous and steely journey for this accomplished Chef. Talbot has invest ed 15 years of blood, sweat and burns leading kitchens for some of the nation’s top restaurant organizations. The Concorde Group, Points West Hospitality, The Glowbal Group, Kanke Seafood Restaurants and the Metropolitan Hotels are just a few of the organizations he has spent time with sharpening both his culinary and cultural acumen. 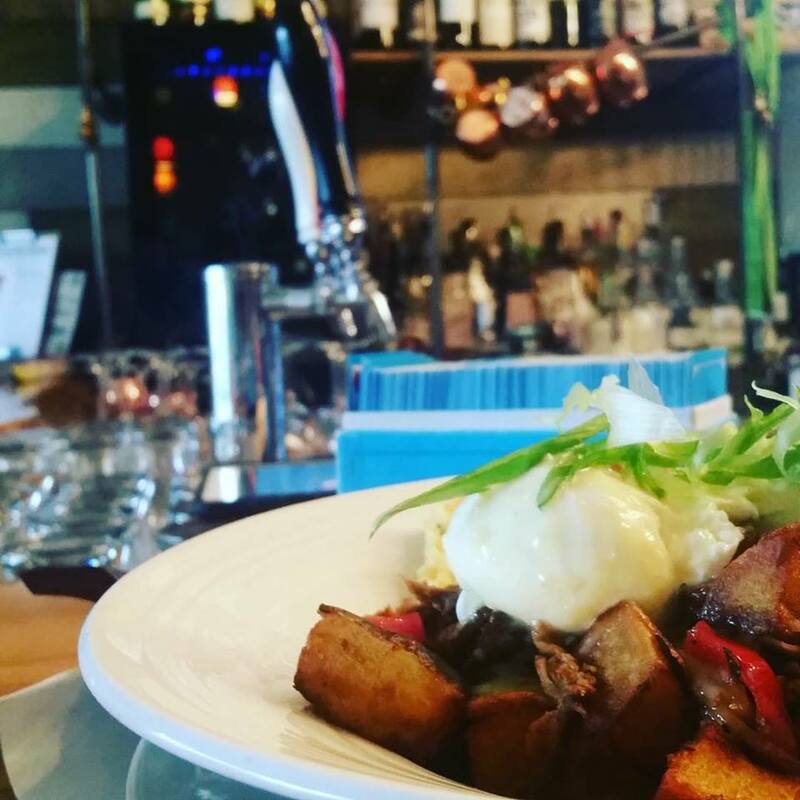 After stretches in Toronto, Vancouver and Whistler, Chef Talbot has returned to his hometown and gastronomic roots to explore his love of regionally inspired cuisine. A sincere and borderline obsessive foodie, Chef Talbot’s travels and experiences have helped him to cultivate a personal style that has Pan-Asian influences but a healthy respect for classical culinary traditions. He describes his cooking approach as eclectically simple. 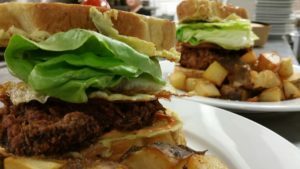 “I am inspired by so many different techniques but emphasizing fresh, uncomplicated and pure flavors are my goals.” Chef Talbot’s cuisine incorporates Slow Food and Locavore principles then accessorizes them with passion and innovation. Unique pairings, fusions of styles and distinct accents elevate familiar dishes into extraordinary experiences. Although he prides himself on his pioneering cooking approach, he adamantly states his creations are always humble and familiar as mom’s home cooking. 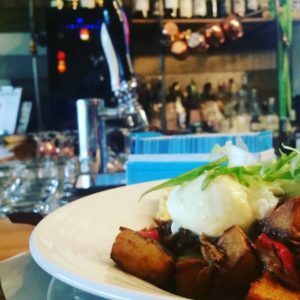 As a top toque, Chef Talbot is dedicated to empowering a core of chefs that are pledged, sincere and that like to play with their food – to producing savory and exuberant menu offerings. 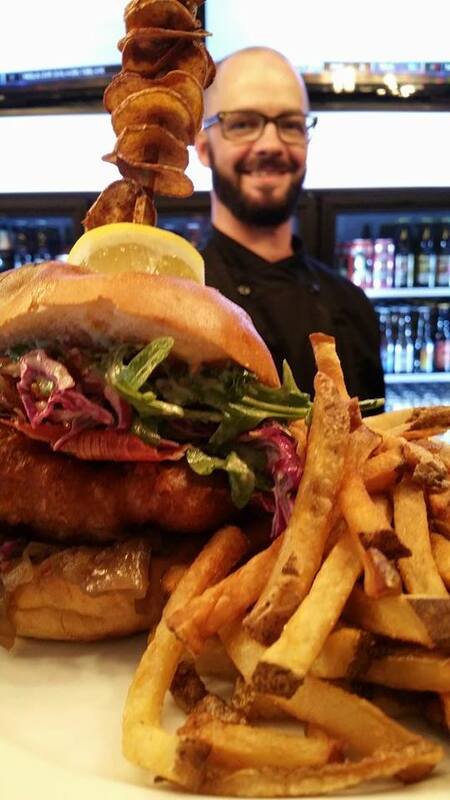 To add more to Chef Talbot’s plate, we also asked him to design our June Burger of the month – which brought forward “The Codfather”. This delicious dish has caused rave reviews over the month of June, exceeding our wildest expectations. Coupled with the fact that with every Codfather sold, Rieley and Kim are donating $2 to the Canadian Cancer Society chapter in Red Deer on behalf of Cilantro and Chive. Chef Jarett chose this cause because Cancer took his Mother and Grandfather. 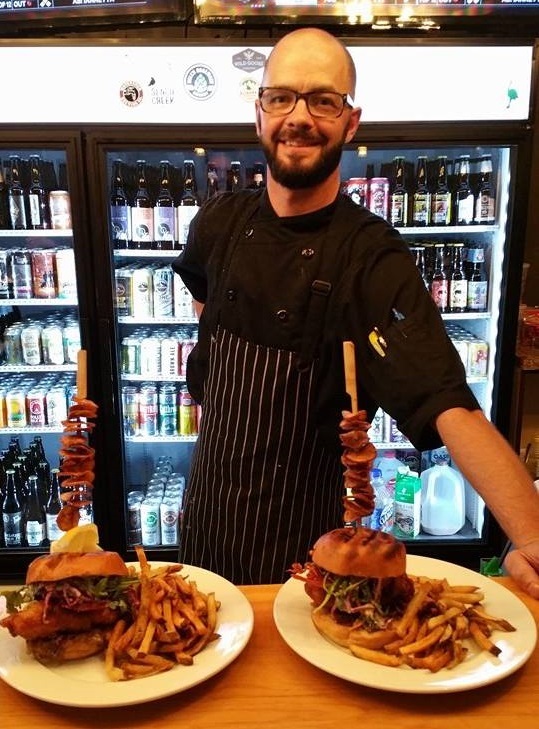 We are very excited about the future of Cilantro and Chive, as we continue to push forward in creating and inspiring new dishes, sourcing out more local product, and most of all continuing to find people like Chef Jarett who believe so strongly in our core values. There are only a few short days left to experience “The Codfather” before it’s gone. Won’t you join us? 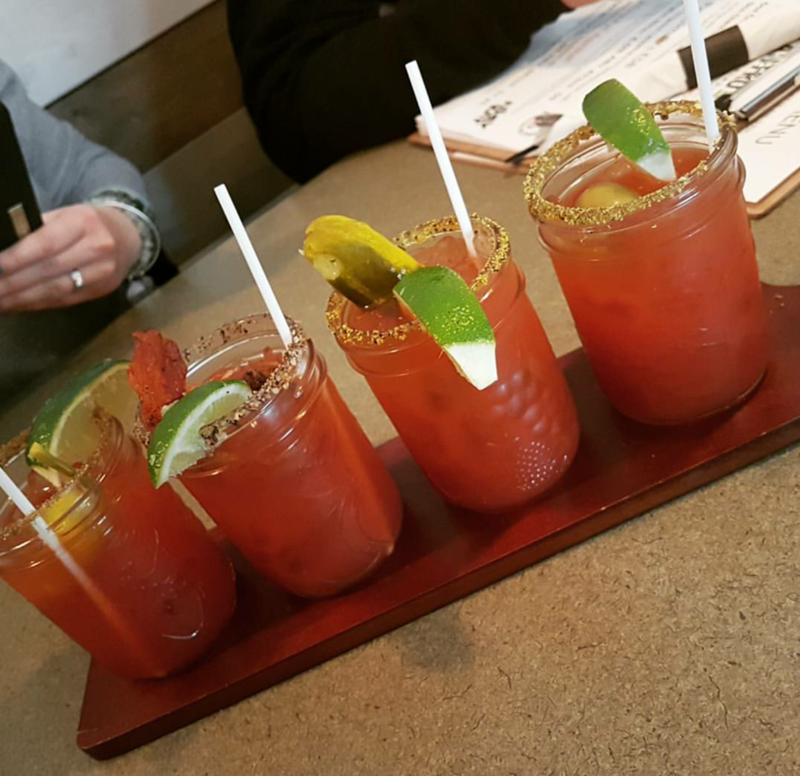 We’ve just kicked #SundayFunday up a notch, because we’re now open on Sundays! 10am-9pm, while also offering our tasty fresh Brunch Menu from 10am-2pm! It’s been an incredible road since we opened 17 months ago here in Lacombe. We’ve been listening to our guests for months now; answering voice-mails on Monday mornings, getting reservation requests for Sundays, and unfortunately having guests rattling our doors. You’ll notice a number of new faces on our team here at Cilantro and Chive, as we’ve been recruiting more of the most energetic and passionate people to serve you! We continue to grow, and are always humbled by the support from the local community and beyond. Every day we meet new guests from around Alberta, and we’re just proud to be able to showcase some of the best food, beer, and spirits that our amazing province has to offer. We hope to see you any day of the week, but especially on #SundayFunday! Be sure to make a reservation, so we can save you the best seat in the house for you and yours. When you do, please don’t hesitate to ask for our owner Rieley Kay or myself, we’d love to meet you! https://cilantroandchive.ca/wp-content/uploads/2017/02/dark-CilantroChive-logo.png 0 0 Jason Burns https://cilantroandchive.ca/wp-content/uploads/2017/02/dark-CilantroChive-logo.png Jason Burns2017-04-25 05:00:252017-04-27 15:24:21Now Open on Sundays! The Friends of PES Fundraising Society have embarked on an exciting journey to redevelop the Ponoka Elementary School Playground. The existing playground has deteriorated and become a safety hazard to those who continue to utilize it. The playground redevelopment project will replace the old playground equipment that is scheduled to be removed with new equipment centered around the modernized DWMS site that is fully accessible and age and skill-level appropriate for the community to enjoy. The Friends of PES Fundraising Society, is committed to “developing an exceptional playground and learning space for the PES Community and the greater community of Ponoka & surrounding areas”. They have been planning and fundraising for this project since Spring 2014 with more than $10,000 already raised. With costs expected to be more than $750,000, partnering with our corporate community and local, county and provincial governments will be critical to create this incredible play space for our children and their families to enjoy for years to come. They are hopeful that active building of this project will begin in the Fall of 2015. People of all ages, abilities and backgrounds will be able to enjoy these spaces for many years to come. Last Friday we had a guest in the restaurant with her kids and had a less than favorable time. They wanted “nothing” done about it and every option given by our staff was quickly turned down . Even though there wasn’t anything we could do or that they wanted done, we still discounted their entire bill. 15 minutes after they left we received a negative review to our facebook page expressing their displeasure. They even signed up for TripAdvisor that evening to give us a negative review. Today we had a guest in who had ordered a steak sandwich. The steak was overdone and was brought to our attention. Like the situation Friday, we gave a discount without being asked to do so. The difference today, was that this guest was upset that we gave her a discount as it was ‘unnecessary’. I assured her that it was our error and our way of attempting to make it right. Instead of taking the discount, she gave us the money back (and then some) to donate to our Community Causes Campaign. While we try and please everyone who comes through our doors, we simply aren’t everyone’s cup of tea. Today I was touched by one guests understanding and unnecessary generosity. I’ll say it again, we truly have the best guests around! The squadron has a current fundraising project to move to a new building. Cadet numbers have been growing over the past few years and their existing building will outgrow their needs. In addition to this, their current building needs several upgrades which they are not in a position to fund at this time. The projected timeline is to move at the end of this training year (June 2015). The Air Cadet program has had a significant impact on the youth in the community, with young people aged 12-18 attending the program from Ponoka, Lacombe, Rimbey, Stettler, Blackfalds and other surrounding areas. These cadets learn leadership, citizenship, teamwork, aviation, marksmanship, survival, fitness, discipline and respect. In addition, they also have optional activities such as; band, biathlon, effective speaking, sports teams, survival challenges and drill teams. They have a significant impact on the veterans and support all of these important causes. They currently they have 57 cadets, with weekly new registrations. 65 squadron doing our part to support the poppy fund campaign for our Legion. Well done cadets!!! In November of 2014 cilantro + chive will initiate our own Community Causes Campaign. Every month we will showcase a new and worthy Community Cause. $.50 from every burger sale will go towards the selected cause for the entirety of the month. We want to hear from you if your group or organization is looking for assistance. Non-profit organizations & groups with a project or funding goal that encourages community growth. Preference will be given to fundraising efforts to benefit children and youth in our community, and groups and organizations with causes that will benefit the greater community. Send an email to cilantrocatering@live.ca with a subject line of Community Causes. There will be an opportunity for in restaurant advertising to promote your cause, be prepared to provide print materials/logos etc. that can be used to educate our guests about your cause. Cilantro and Chive will honour the $.50 burger sale contribution up to a monthly maximum of $500. As is the norm every year, this year was no different. The list of nominees are full of big names in the business world that do amazing things for the community and their customers. The contenders in each category deserve a huge pat on the back and the winners (in bold) a big ol’ high five.